During his recent field trip to the south-central provinces of Binh Thuan and Khanh Hoa to explore the potential for renewable energy development, Bruno Angelet, Ambassador and head of the European Union Delegation to Vietnam, told VIR that Vietnam boasts great potential to develop wind and solar power projects. “The EU is greatly interested in developing these projects and it has always been a leading provider of high technology,” he said. 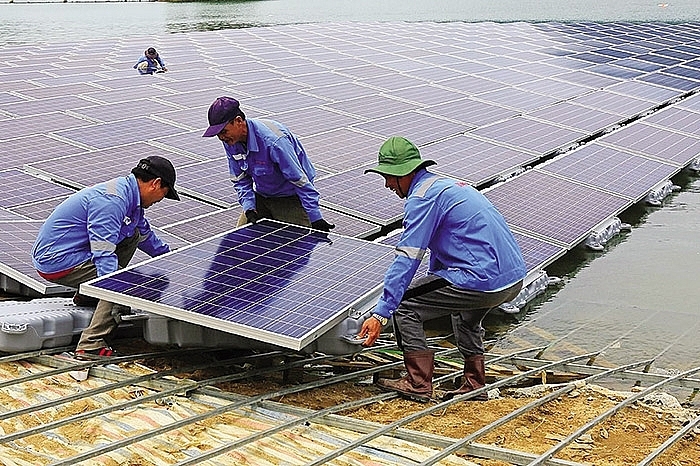 The Vietnamese Ministry of Industry and Trade (MoIT) is said to have given the green light to implement a floating solar power plant in the area of the Se San hydropower plant located in the Central Highlands region, with financial backing from the EU and France. Duchateau Koen, head of Co-operation under the European Union Delegation to Vietnam, also told VIR that some European investors are becoming interested in implementing renewable energy projects in the nation. “With the country’s growing demand for electricity and investment capital for further electricity development, the EU will continue supporting the implementation of renewable energy projects, with a focus on floating solar projects,” Koen said. The US Department of Commerce’s International Trade Administration (ITA) cited state-owned Electricity of Vietnam’s (EVN) estimates that around $123.8 billion will be channeled into the development of the national power system within the next 20 years. Spending was estimated through the revised Power Development Plan VII, which averages $6.8 billion per year. Of this, 66 per cent will be spent on power plants and the remaining 33.4 per cent on network development. EVN has received preferential loans which amount to $1 billion in 2016 from international financial organisations, such as the World Bank, the Asian Development Bank, the Japan International Co-operation Agency, and the German Bank for Reconstruction. Furthermore, EVN has been working with the French Development Agency to provide the former with two further loans for the Se San 4 solar power plant and the Ialy hydropower plant extension projects. In June 2014, the World Bank approved a $200 million loan and $70 million credit for the Vietnamese government in support of its power sector reforms, as well as climate resistance and development programmes towards lower carbon intensity. According to the ITA, there are plans to invest in up to 98 power plants with a total capacity of 59,444 megawatts (MW). Of which, EVN would build 48 power plants with 33,245MW capacity, with an estimated total investment of $39.6 billion. According to the ITA, US investors also want to develop renewable energy projects in Vietnam. Currently, US companies are finding significant business opportunities in market segments such as equipment sales for ongoing and upcoming power generation projects, and gas-fired and renewable power projects, and investment in independent power projects (IPP) in the form of build-operate-transfer (BOT), build-transfer (BT), build-transfer-operate (BTO), and joint venture projects. Currently, only one US company, AES Corporation, has an IPP and has invested in the Mong Duong 2 power plant located in the northeastern province of Quang Ninh. The $2.1 billion coal-fired power plant with a capacity of 1,240MW is the largest foreign-invested power project nationwide and the country’s first private power plant commissioned during the last 10 years. AES contributed a 51 per cent share in the plant. There are currently 73 power plants (hydro, thermal, gas, renewables) in the country, with 48 having a capacity greater than 30MW. With EVN’s self-financing and other sources of debt financing only able to meet 66 per cent of the total investment requirements, IPPs are expected to carry a large portion of the investment in the power generation sector. This includes those to be developed by foreign investors, the ITA said. According to German Ambassador to Vietnam Christian Berger, the country offers large opportunities to renewable energy investors. “Germany believes in the nation’s great potential for renewable energy, both from solar and wind power. Furthermore, there are immense opportunities for investors to develop these projects,” he told VIR at the site of the 24MW Phu Lac wind farm in the central province of Binh Thuan’s Tuy Phong district. The project has received €32 million ($36.4 million) worth of funding from the Germany government. Two years after being commissioned, the project’s operational results have exceeded targets. During the past operational year, power generation amounted to 64 gigawatt hours (GWh), higher than the initial target of 50GWh, and enjoyed technical availability of 99.8 per cent, against the initial target of 95 per cent. While the Vietnamese government wants to lure in more renewable energy investors, a series of obstructions are discouraging investors from cultivating projects. One of the hurdles lies in the current dispute resolution mechanism. Currently, all disputes are to be settled via Vietnamese laws, and there is yet to be a single regulation where disputes can be solved via international arbitration or tribunal. Specifically, under Article 7 of the Ministry of Industry and Trade’s (MoIT) sample contract for wind power purchase agreements (PPA), parties must first negotiate to settle disputes within 60 days. If this is unsuccessful, disputes should be referred to the MoIT’s General Directorate of Energy (GDE), now restructured as the Department of Electricity and Renewable Energy for assistance or to the Electricity Regulatory Authority of Vietnam (ERAV), in accordance with Circular No.40/2010/TT-BTC. Circular 40 provides a settlement mechanism for disputes in the electricity market. Either party that does not agree with the conclusion of the ERAV has the right to initiate a lawsuit at court for settlement. Furthermore, under the MoIT’s sample contract on solar PPA enacted in September 2017, the equivalent provision in the solar PPA contains the same dispute resolution procedure, the only difference being that as an alternative to referring the case to the ERAV under Circular 40, the parties may agree to select a dispute settlement agency to settle the dispute in accordance with relevant laws. “I think this dispute resolution regime is unattractive for foreign investors as it is likely to be time consuming if the parties to the PPA are obliged to follow these procedures in a chronological order,” Long Huynh, senior associate from international law firm Hogan Lovells International LLP’s told VIR. Hogan Lovells recently conducted a study on Vietnam’s renewable energy. The firm sees some obstacles, including the dispute resolution mechanism which is expected to continue making it difficult for the Vietnamese government to further attract renewable energy investors. “Dispute resolution by the Vietnamese authorities or state agencies may not be viewed as an impartial mechanism, particularly in view of EVN being a state-owned entity related to the regulator,” said the study. Koen from the European Union Delegation to Vietnam told VIR that in general, PPAs remain a headache for foreign investors as they are now considered “unbankable.” Difficulties also remain regarding land access, and connecting power from projects to the national power grid. - Corporate income tax: Income from new investment projects for renewable energy production will be subject to corporate income tax (CIT) at the rate of 10 per cent for the first 15 years. By comparison, the lowest CIT rate available to regular companies is 20 per cent. - Import duty: There is an exemption from import duty with respect to goods imported in order to construct or form fixed assets, such as raw materials, manufactured materials, and other components. - Land-related incentives: Investors may be entitled to exemption from the land use fee that would usually apply for 11 years or, in cases where the investment project is in a region facing extreme socioeconomic difficulties, 15 years. In addition, during the capital construction period of a project (being the period of construction of a new building or plant for up to three years from the effective date of the land lease contracts), investors are entitled to exemption from land rents and water surface rents. Furthermore, land clearance compensation and support will be provided, in accordance with the Law on Land. All land leases and land allocation for renewable power projects are to be handled by the relevant provincial people’s committees.